Creating sugar cookies for my friend Jayne (a British expat) is always a pleasure because she gives me so much creative license. She has been a big supporter of my sugar cookie craft for almost a decade now, and I have her to thank for prompting me to pick up the pace and churn out cookies by the dozen each and every season. Her request this time around was simple: "design a set of Easter cookies for my family in England and make them pretty." After going through my archive of past cookies, and perusing the cookie cutters in my pantry, I decided on a few shapes and designs for these special U.K. bound cookies. 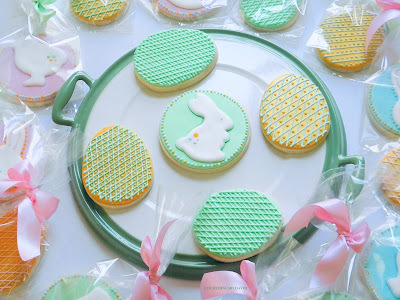 A large Easter egg cookie cutter, a large five inch plain-round cutter, and some very special cookie cutters from the former Martha by Mail catalog were all gathered on my large kitchen counter. I then quickly began to plan Jayne's cookies. 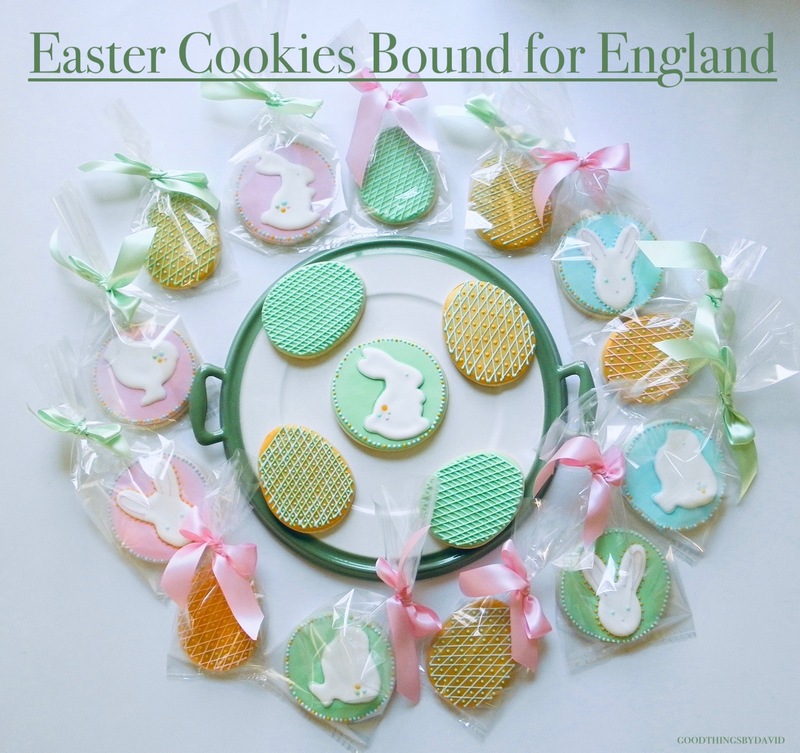 Have a set of baked and cooled egg-shaped cookies and several large round ones as well. Batches of royal icing should be tinted a very deep egg-yellow, a mint green, a light pink, a light blue and white, of course. Ice all eggs in the bright egg-yellow royal icing (OK, some were made in that minty, jadeite green) and allow them to dry completely. Using a cake decorating airbrush kit, and Americolor gold highlighter, spray all of the egg cookies evenly and let them dry. Once they have dried, using a #1 piping tip, add a cross-hatched pattern to each egg in alternating colors. You can then add small dots in between each opening as shown. Let them dry completely. 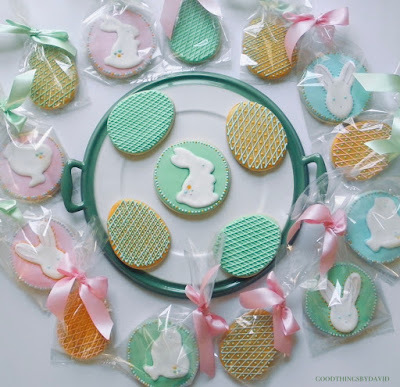 For the bunny and chick shapes, I used my Martha by Mail Easter marshmallow cutters that I adore. The bunny and chick are beyond adorable. I think they're perfect for cutting out cookies, but they're also ideal for tracing shapes onto cookies. Flood each round cookie in either mint green, light pink or light blue royal icing using a #4 piping tip. Let the base dry completely. With an edible marker, trace the baby chick, and bunny (I also used a special bunny head cookie cutter for the other shape). With white royal icing, outline and flood the shape as shown. Immediately add 4 small colored dots on their little butts, and then add small dots for eyes. Each cookie then gets a dotted border. Alternate up to three colors like I have done and make each border unique. 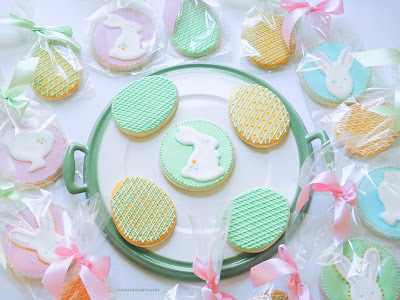 I have a feeling that every member of Jayne's family across the pond is going to love having one of these Easter cookies. 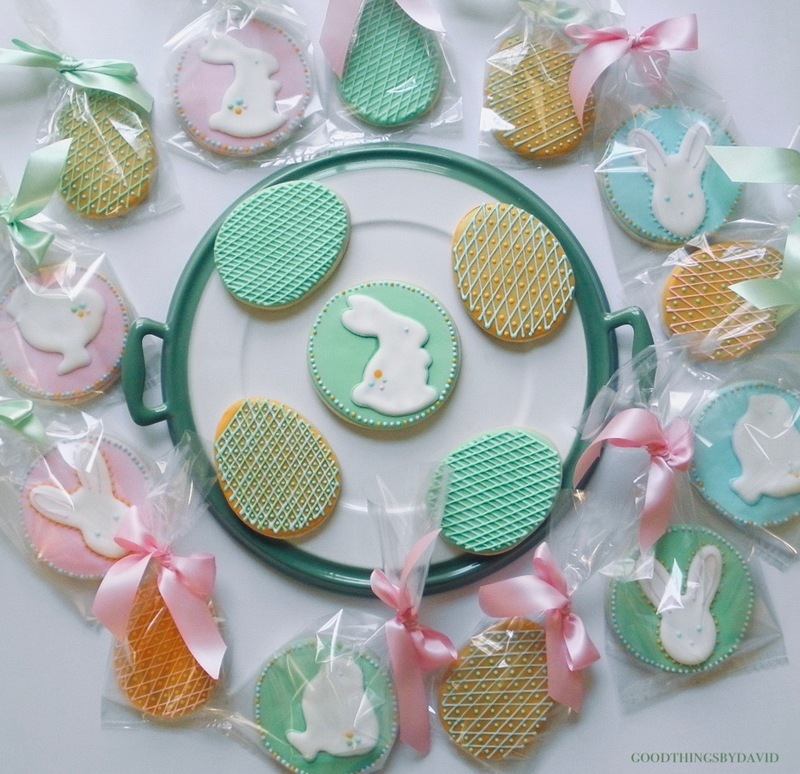 Packaged in clear cellophane bags and tied with gorgeous satin ribbons, the Easter treats are stylish enough for baskets, platters or neatly-wrapped presents. Have you started your Easter cookie baking yet? My thanks to Jayne for her continued support of my craft. Let's keep on piping!